One of my favorite places in the entire world is Kaunolu on the Hawaiian Island of Lana`i. Kaunolu was the summer home of the Hawaiian King Kamehameha in the 1700s. Today, it lies at the end of a much-improved 4x4 road (which used to be not more than a trail through lava flows). The waters are crystal clear, and typically teeming with fish. Abundant ruins left from the ancient Hawaiian habitation of the area remain, hidden amongst the gnarled kiawe trees and pili grass. Here and there you can see some interpretive signs erected by the Lanai Cultural and Heritage Center that will help you learn more about what once stood there. Atop a bluff forming one half of the Kaunolu Gulch lies the ruins of a giant heiau (Hawaiian temple), and the notch cut into the rocks known as Kahekili's Leap. This was a place where Kamehameha was thought to have asked his warriors to leap into the ocean, some 60 feet blow, to prove their loyalty. 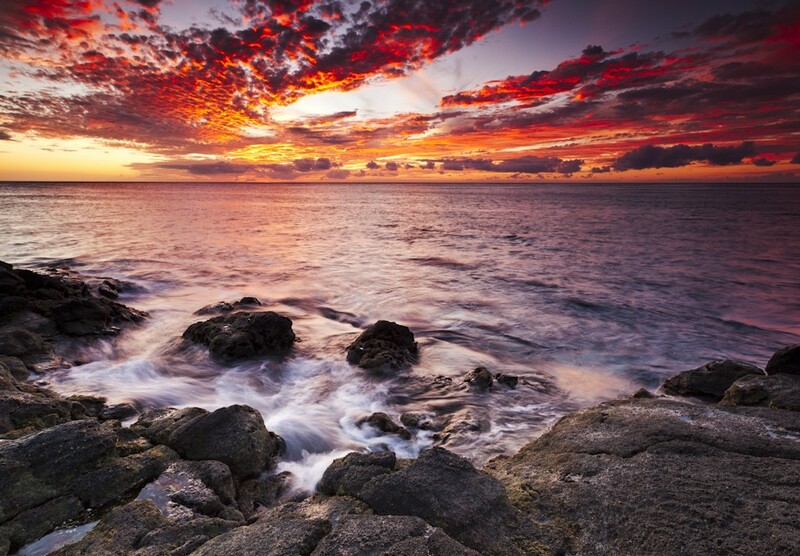 Kaunolu is on the southernmost tip of Lana`i, and as such it offers gorgeous wrap-arpound sunsets. I love to camp and photograph there, under the stars, amongst the breezes and spirits. And of course, spear fishing for your dinner is always an added treat!